"The future of Air Science is rooted in a culture that encourages product innovation, continuity in our management team, proactive improvements, a strong focus on our employees and a constant desire for customer satisfaction. Our ISO structure has been a great benefit to us. This is part of the reason we are quickly taking the Air Science brand to global markets. My background as a Certified Public Accountant has served us well. I started with the company in 2001 when we shared one room in an office building. Even then, we were focused on continuous improvement and product quality, which is why it's no surprise to me that we've grown from within to serve the markets we know today. We're known for quality and integrity, and our infrastructure supports this throughout everything we do." Michele Burns loves her job and her family. Air Science combines these loves. 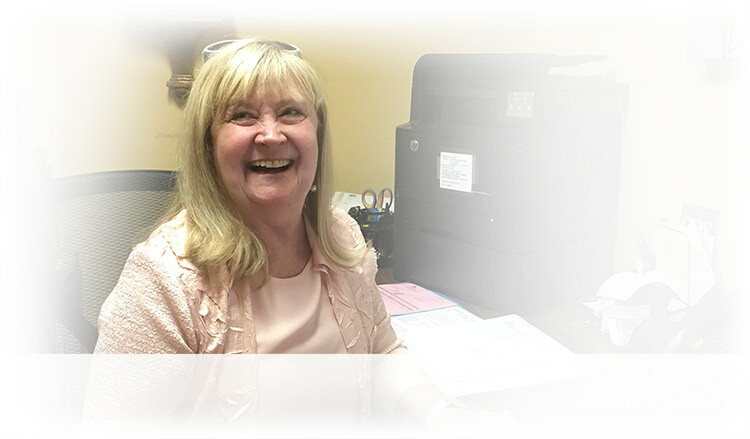 The daughter of founder Andy Chambre and sister of Paul Chambre, Michele manages production and accounting systems for the company, taking advantage of her background in industrial engineering. She is a graduate of the University of Massachusetts and earned an MBA from Embry-Riddle Aeronautical University. She understands big systems. An avid pilot, Michele is a former employee of Sabre, the American Airlines reservation system, and married to a commercial airline pilot. At work, Michele trades the freedom of flying for the chance to see ideas realized quickly in a relatively small company. As Air Science continues to expand its product line and its global footprint in international markets, Michele is expanding her work in areas such as infrastructure, quality systems and cost control. As in the past, she will continue to review and manage feedback from the Air Science factory floor where ideas for product improvement come from the craftsmen and craftswomen who have their hands on the product each day. She also appreciates the work ethic of a diverse employee base and credits factory workers for an aggressive cross-training program which assures continuity in the manufacturing process and enriches every position. As the company grows, Michele is confident the systems she and the management team are putting in place will ensure the most efficient expansion of the workforce and the highest level of productivity. "I learned this industry from the inside out starting in 2008, and I'm still learning. I see first hand the challenges our customers confront, especially those who literally invented processes out of need, processes we take for granted today. They are curious, inquisitive and always searching for a better way. It's our job to support them, to develop and deliver products they can use with confidence. We have a high field presence in the UK. It's part of what we do, from consultative sales to installation, commissioning and service. Our product quality is impeccable; always has been and will be. Our reputation is based on quality. This is why we have earned so much repeat business. Our customers expect innovation from Air Science, which is why we are proactive product development. With so much positive feedback from facility and lab managers, I am positive about the future of Air Science." In 1978, Carlos Granados earned a degree in Mechanical Engineering from the National University of Callao, Bellavista, Peru. 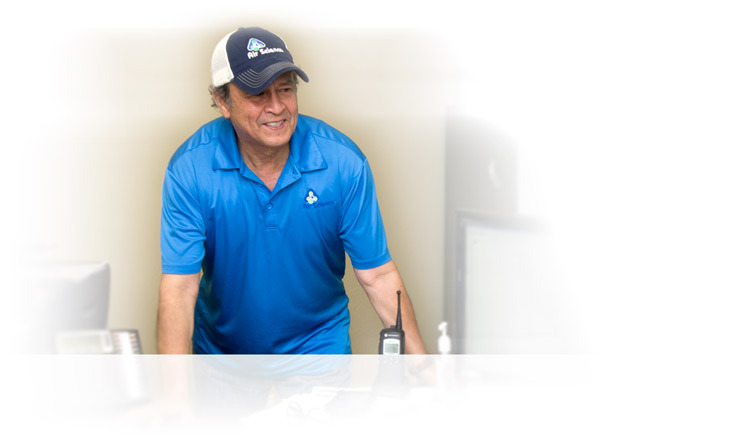 Following his family's emigration to America in 1990, Carl worked several jobs before landing a position with Air Science in Fort Myers, Florida. A naturally curious engineer, Carlos quickly embraced the concept of computer aided design as this new science evolved among a variety of computer platforms. He originally designed prototypes of new products on the drawing board, but brought new efficiencies to the company as he transferred drawings over to CAD systems and initiated a prototyping process on the screen before materials and labor were committed. He credits company founder Andy Chambre with supporting and encouraging him with the time, effort and investment required to put a powerful development tool to work for the company. As a result, whatever customers need, whether standard or custom engineered products, Carlos can build in a virtual reality for proof of concept. 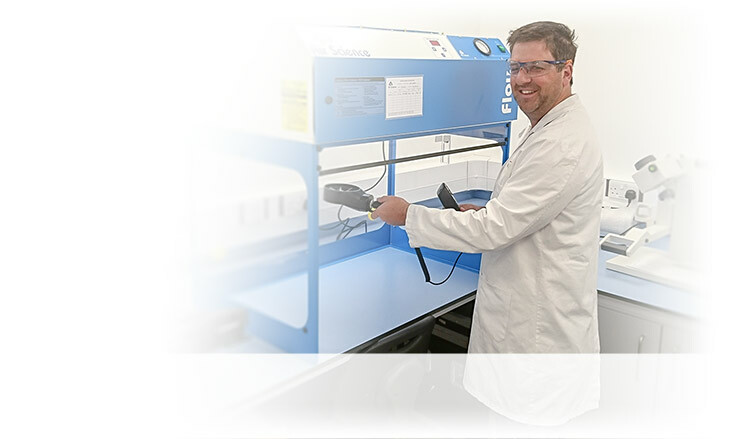 His hands-on experience in the factory, first with polypropylene and most recently with stainless steel, has given Carlos an affinity for the tolerances, bend radii and other characteristics of the two feedstocks that comprise the Air Science product family. Imagineering, from ideal prototype to a product out the door, is what sets Carlos free to create, to improve and to dream. A father and a grandfather, Carlos looks forward to the challenges set forth by a strong international marketing initiative, new robotic manufacturing investments and a continuous learning process that extends to customer needs in the real world. Carlos is another example of Air Science employees living the American Dream and crafting a future for himself, his family and the entire Air Science family. "I started with Air Science in 2007. My background is in pre-med. I earned a BS in biology and spent a year in graduate school focusing on microbiology at the University of Nebraska. After moving to Florida, I met Andy and started as a sales representative managing customer phone calls and technical support. Today, I oversee the inside sales team, and assist with marketing, product development and outreach through industry trade shows, seminars and technical presentations of interest to our customers. Our progress has been remarkable as we move from one objective to another. An example is earning our certifications such as NRTL listing for electrical safety to UL/CSA standards, as well as other internal processes to put everyone on the same page here in the factory. Innovation is the key to our growth, but not at the expense of customer service. We've created a system of modular designs that give us a high degree of flexibility in responding to customer needs. Examples of this are the introduction of the Purair RX and Purair Safesearch ductless cabinets. And, while other companies shy away from custom designs, we pride ourselves on finding solutions to meet special needs. Our engineering team has a strong record for development of ductless filtration systems that are not standard products." Tina Walts, Air Science manager of quality and safety systems started her job at Air Science 13 years ago. She has held jobs in quality control, shipping, components preparation and ISO compliance. She personally examines each Air Science product prior to shipment. 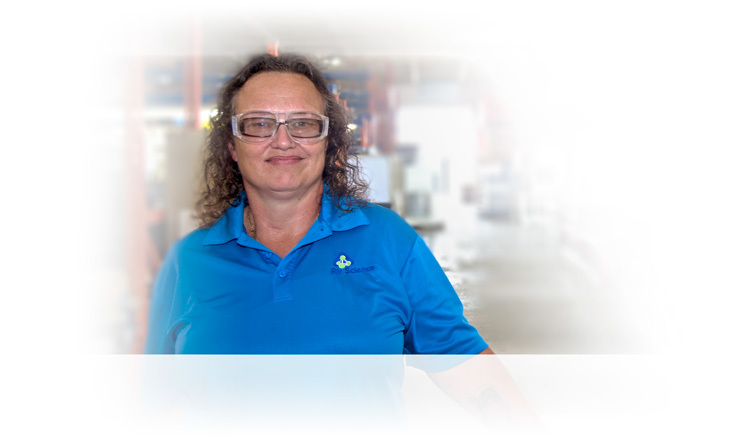 As the company has transitioned from polypropylene and plastic substrates by adding new stainless steel based cabinets, she has maintained her focus on the plastic side while bringing her experience to the metal shop. She is sensitive to factory ergonomics, component staging, assembly and process flow and employee safety. Married to Scott Walts, Air Science factory production manager, both Tina and Scott claim they rarely see one another during the work day, but the family culture of Air Science suggests that there is at least a little factory talk on the home front. Her work in factory-wide safety systems and training briefs is always communicated in two languages. As she walks the factory floor, she is always impressed with employees who continue English language lessons concurrent with their assembly work. As a veteran Air Science manager who started from the ground up, Tina is grateful to see the company grow with the addition of a multi-cultural work force. Her personal approach to onboarding and employee training yields significant benefits in employee retention, productivity and quality. Her proactive approach to safety includes regular invitations to OSHA inspectors who offer another set of eyes as she safeguards the welfare of each worker in the company. As a professional, she maintains a robust portfolio of alliance partners and peers in other companies who share her desire to adopt best practices, an attitude that benefits Air Science, regardless of the source. Scott Walts started with Air Science 14 years ago building carbon filtration enclosures when there were only three people in the shop. He came to the company from Disney World after his department was outsourced, but he still knows Mickey Mouse personally. Scott is a veteran Air Science employee who has not only seen the company grow, but has been instrumental to its success. 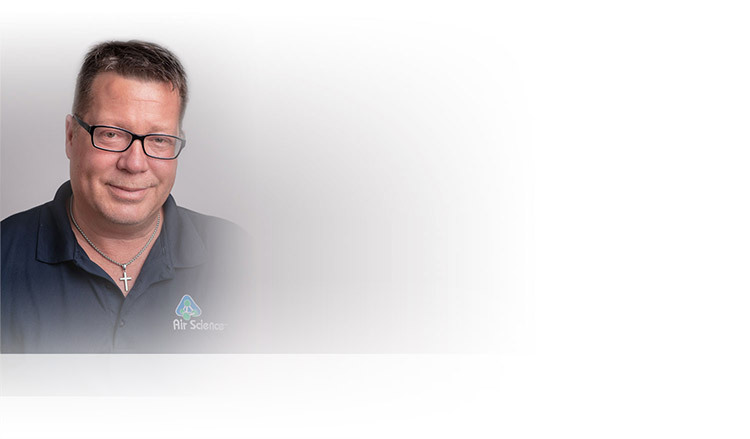 As production manager overseeing plastic, metal and filter construction, Scott is familiar with every product in the company's portfolio and the people who craft the Air Science product line. He is a hands-on person, a problem solver, a tinkerer and the go-to for keeping the factory running smoothly. He is particularly proud of his workforce, now comprised of immigrants from Puerto Rico, Mexico, Argentina and other Latin American countries, all of whom have navigated the process that leads to the path of citizenship. This is one reason Scott sees a bright future for Air Science, both in the USA an around the world. 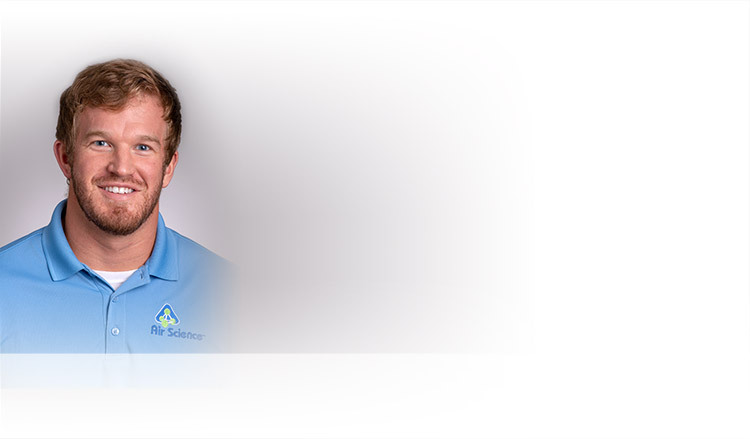 Like all Air Science employees, Scott considers the company a part of his family. He has been with the company from the beginning and met and married Tina along the way. Yet he knows this culture will be challenged as new faces and changing technologies demand personal growth along with resources in human relations, training and safety. A lifelong learner, Scott expects to take these challenges in stride, and depend on his family, both at home and at Air Science, to achieve success one day at a time. When you work in sales, it's important to believe in your company and your products. If you don't, your customers will know. 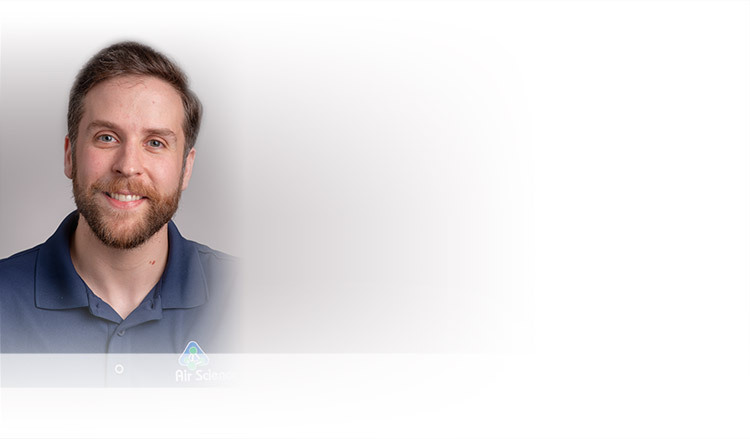 "Especially over the phone, if you're not excited about the product, they can hear it in your voice," observed Matt Knaub, a sales technician at Air Science for the past year-and-a-half. He's learned much since joining the company and enjoys sharing his expertise with others. "Our products are amazing to me and I like the scope and range of our customers. We work with everything from schools, to mom-and-pop pharmacies, to NASA and the FBI." Members of the Air Science sales team help customers identify the best product for the job. They follow the account through ordering, delivery and service. It's that full range of customer service that sets the company apart from others. 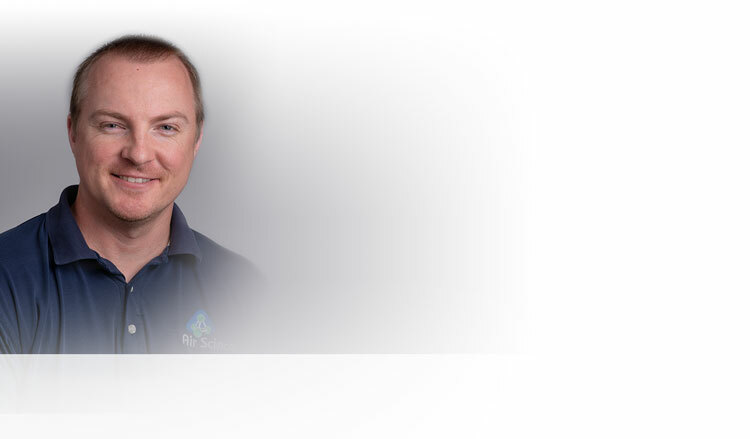 Prior to joining Air Science, Matt worked in the sales and installation of audio and video equipment. It was a job that was very hands on and one he believes was good experience for his current position. Growing up in Florida he was home schooled, a situation he said laid a good foundation for a career in sales. "I knew what had to get done, but I was able to set my own schedule," he said. "It applies to the real world – I was given responsibility and I knew I would be held accountable." Matt said it's a good feeling to know Air Science products are helping to keep others safe. He referred to the SafeSwitch system as an example. The filter system helps protect lab workers who could come in contact with dangerous substances such as Fentanyl, opioids or other narcotics which can be harmful in small amounts. Recently, Matt and his wife became parents for the first time. Taking on the role of father is yet another learning experience for him. "It's all so new," he said. "Sleep is what we are striving for – sleep is what's ‘fun' right now." For Duane Parsons, the role of Air Science sales technician goes way beyond the sale. "We start by explaining the actual application of our products," he said. "We offer the best possible solutions to a wide variety of needs." Parsons joined the Air Science sales team in July of 2017. "We are always learning and growing," he said of the company's range of products. "The key is product knowledge and servicing the customer. It's important to have a sense of urgency and to follow up. It's about retention." With a degree in business management, Duane lived in the New York area for some 30 years. He even served a short stint in the military. Seeking a change of pace, he moved to Florida. Sales has always been his passion. "You're always learning and it can be very challenging, but when you get it all down you feel accomplished," he said. "We work as a team. We all work together toward a common goal. We are small enough to care, but big enough to compete." Duane enjoys working with customers from Air Science's Fort Myers offices, but likes going on the road for training or to visit with customers, too. "Seeing our products in action is always great." He is excited about the future of the company. "We are set to grow globally, for sure, to do a lot more international business. I think we are just scratching the surface." Jared Shouts says working in sales is like working a puzzle. "Working with customers to help them find the right product is fun for me," he said. "It feels like you have a puzzle and you are putting the pieces together." A member of the Air Science sales team since April of 2016, Jared said it's his job to make sure the customer is getting the right equipment. He provides quotes for the job, makes sure orders are placed and properly shipped. He can even answer technical questions. "We carry them through the purchasing process from start to finish," he said. That attention to detail makes a difference. Jared says the company and its products are the right fit for its customers. "I like that all of the manufacturing is done just steps from where I sit so if someone has a question on an order or a particular piece of equipment, it's easy for me to go out and physically see the unit in question and talk with the people building it." 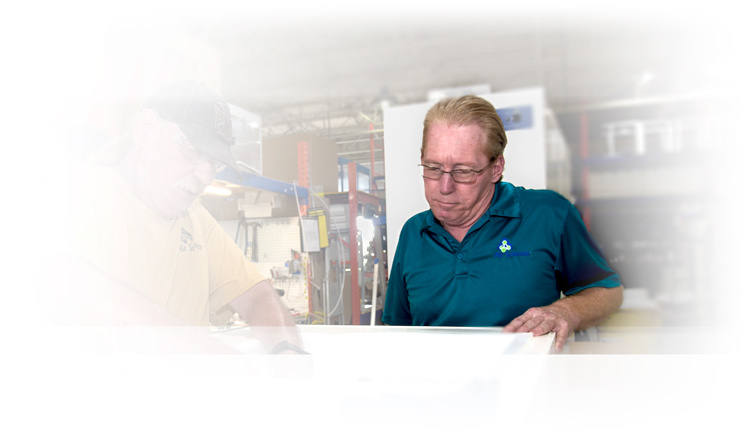 Air Science produces a variety of ductless fume hoods, biosafety cabinets and air filtration products. "It feels like a small company but its's exciting because we get larger deals, such as customers like the DEA, the Canadian Mounted Police and Facebook." Jared and his wife Nicole moved to Florida from Minnesota in 2015. While in Minnesota Shouts worked as a regulatory analyst with the 3M Company. He has bachelor's degrees in biology and physics with minors in chemistry and mathematics, all from the University of Wisconsin-La Crosse. That background in science has come in handy at Air Science. "Another thing I enjoy about Air Science is working with forensics departments, which I get to do a lot," he said. "My wife and I are big Forensic Files, Dateline Mystery, crime podcast fans." The couple soon will welcome their first child. In the meantime they enjoy fishing and walking their dogs, Dexter and Mildred. There's also football. "My family is still in Minnesota and we are huge Vikings fans," he said. "I never miss a game down here."